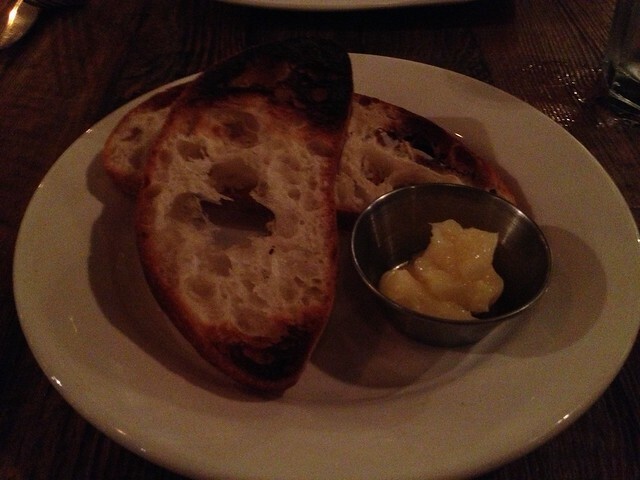 A disastrous dinner at Kitchen Story! I REALLY wanted to like this place! I’ve been to 3 of the previous restaurants in this seemingly cursed location, and the mediocrity continues! 7×7 Magazine has this place on their list of date spots, which is great if you’re speed dating (more on that later). – Even though they only had 2 reservations a 6pm, they couldn’t confirm my reservation. I had to point out my own name on their reservation list! Sad. – There were only 3 tables occupied, but we were still seated at the most dreary, cave-like table possible. The people a few tables over were even using their cell phone lights to read the menu. – Less than an hour into dinner, we ordered another round of wine and declined dessert. They QUICKLY brought our check, had us sign and took it away. This is normally fine, but they also set the 2-top table next to us for three people while the waiting parties breathed on top of us from the bar. I swear they must have pushed the other table closer to ours because the third menu was practically touching our table! Omg, we get the hint! We are no longer customers and should leave! That’s just wrong. That’s what I meant about speed dating above, this place seems to care more about volume than service. Even the table on the other side us felt it. I overheard them when they sat down, whispering that they needed to eat quickly because they were told that their table was reserved soon. Sheesh! If you can’t fit a party in for a decent dinner, please don’t seat them and rush them! We had a reservation and STILL felt rushed! Last time I checked, an hour isn’t a long seating for dinner. Omg, these garlic noodles were disgusting! They tasted like cardboard with dry rot – seriously. 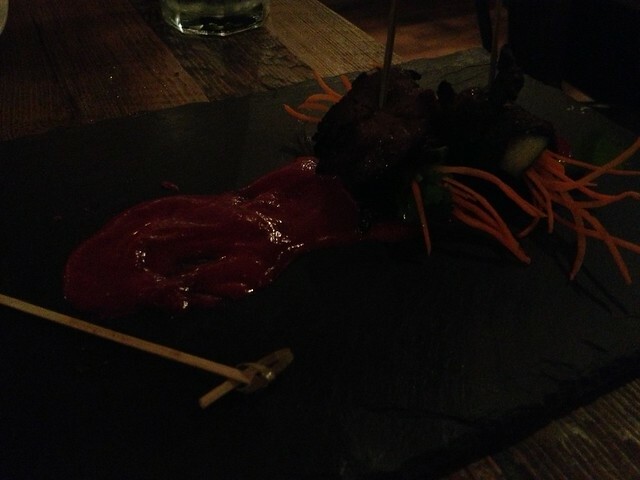 The scallops were overcooked and the bacon made an impenetrable coat around them. This was more like a “slap on the face” than a “big hug”. I know you can’t make anything out, but that’s probably for the better. These meat rolls were hard to chew, hard to handle, and poorly conceived. – The workers are really sweet when they’re not trying to kick you out of your table. – The portions are decent. 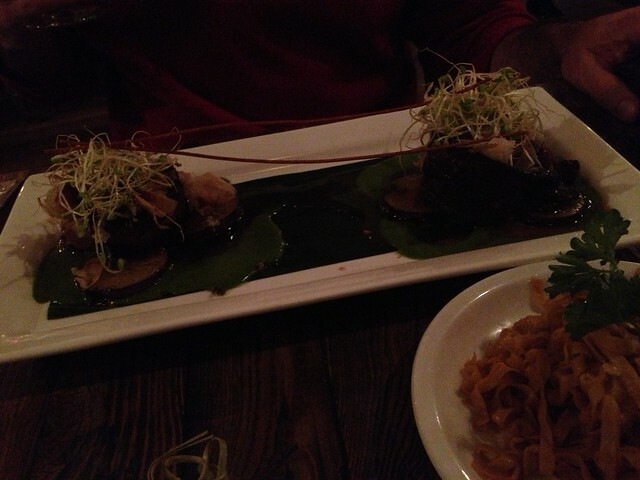 – My Three Buddies short ribs weren’t overly salty. I’ve heard that this place is better for brunch so I’ll give them another chance. Hopefully they won’t completely disappoint again. 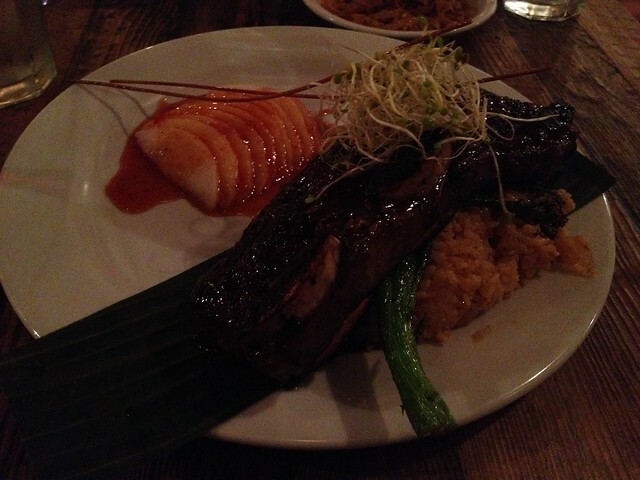 This entry was posted in Kitchen Story, Restaurant and tagged bacon, beef, broccolini, scallop, shortribs by vicentesf. Bookmark the permalink. I loved the humor. It’s sad that restaurants operate in this manner. I have a tendency to leave my comments with the manager when I’m unsatisfied. After receiving horrible service and telling the manger about it, they give me more horrible service and act as if they’re paying me to eat there…the nerve! Hope brunch works out better. Lol, thanks! I do tell management sometimes if I really like the place and I think it’s just an isolated incident. Otherwise, I feel like there are way too many restaurants in San Francisco to bother.